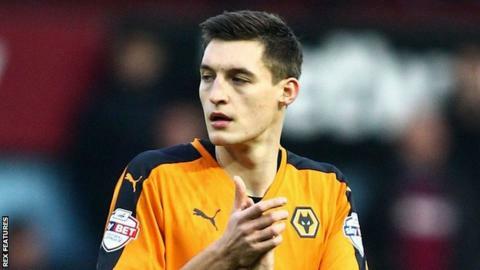 Michal Zyro scored twice on his Wolves home debut to help Kenny Jackett's side to victory over Fulham at Molineux. Having been redeployed up front, Zyro put Wolves ahead after latching on to Jordan Graham's cross, before doubling that lead with a cool solo effort. The visitors were back in it by the break after Lasse Vigen Christensen easily headed in Jazz Richards' cross. Matt Doherty extended Wolves' lead with a long-range goal before a late Ross McCormack strike set up a tense finale. Having now won four consecutive league matches, Wolves move up to 10th in the Championship table, seven points shy of the play-off places, while Fulham remain 19th. The hosts broke the deadlock on six minutes when Graham produced his eighth assist of the season to tee up Zyro, who joined Wolves from Polish side Legia Warsaw last month, to put the hosts ahead. A superb home debut for Zyro continued in the 13th minute when he made easy work of beating Fulham's offside trap to place the ball through goalkeeper Andy Lonergan's legs. The away side worked their way back into the game on 24 minutes when Richards sent a curling ball into the box for Christensen to coolly nod past Carl Ikeme. Wolves re-established their two-goal lead three minutes after the break through Doherty's powerful shot from 35 yards after Graham's corner had been cleared. And, although McCormack scored from 20 yards with just over 15 minutes to play, Wolves were able to hold on. "It was a big win for us and full credit to the players as four Championship wins on the trot is not an easy thing to do. "We wanted to put on a spirited and hard-working performances for our fans as there is some uncertainty around and I can feel it because of the sale of Benik Afobe. "And I felt that the players answered it and responded in the right way and played with a lot of pride in playing for Wolves." "I am trying to find the way for the team. We are not playing the same way that Fulham did before. We are a very good team with the ball but right now very soft without the ball. "It is important to try and have more time with the ball in our possession to stop suffering so much. This is the plan we have for the future. "I cannot blame my players as they tried to follow the plan. At the end we lost the game but they did many, many positive things." Match ends, Wolverhampton Wanderers 3, Fulham 2. Second Half ends, Wolverhampton Wanderers 3, Fulham 2. Foul by Dan Burn (Fulham). Emerson Hyndman (Fulham) is shown the yellow card for a bad foul. Attempt saved. Jamie O'Hara (Fulham) left footed shot from outside the box is saved in the top centre of the goal. Assisted by Tom Cairney. Substitution, Wolverhampton Wanderers. Nathan Byrne replaces Jordan Graham. Attempt missed. Tom Cairney (Fulham) left footed shot from outside the box is too high following a corner. Substitution, Fulham. Matt Smith replaces Lasse Vigen Christensen. Corner, Fulham. Conceded by Matt Doherty. Substitution, Wolverhampton Wanderers. James Henry replaces Michal Zyro. Foul by Ryan Fredericks (Fulham). Jordan Graham (Wolverhampton Wanderers) wins a free kick in the defensive half. Offside, Wolverhampton Wanderers. Danny Batth tries a through ball, but Rajiv van La Parra is caught offside. Attempt saved. Rajiv van La Parra (Wolverhampton Wanderers) header from the centre of the box is saved in the bottom right corner. Assisted by Jordan Graham with a cross. Corner, Wolverhampton Wanderers. Conceded by Dan Burn. Offside, Fulham. Shaun Hutchinson tries a through ball, but Moussa Dembele is caught offside. Goal! Wolverhampton Wanderers 3, Fulham 2. Ross McCormack (Fulham) right footed shot from outside the box to the bottom left corner. Assisted by Tom Cairney. Substitution, Fulham. Ryan Fredericks replaces Jazz Richards. Substitution, Fulham. Emerson Hyndman replaces Alexander Kacaniklic. Attempt missed. Jordan Graham (Wolverhampton Wanderers) right footed shot from the left side of the box misses to the right. Assisted by Kevin McDonald. Offside, Wolverhampton Wanderers. Kevin McDonald tries a through ball, but Michal Zyro is caught offside. Attempt missed. Rajiv van La Parra (Wolverhampton Wanderers) left footed shot from the centre of the box misses to the left following a set piece situation. Attempt saved. Danny Batth (Wolverhampton Wanderers) header from the centre of the box is saved in the centre of the goal. Assisted by Jordan Graham. Dan Burn (Fulham) is shown the yellow card for a bad foul. Attempt saved. Lasse Vigen Christensen (Fulham) right footed shot from outside the box is saved in the centre of the goal. Assisted by Tom Cairney. Attempt saved. Michal Zyro (Wolverhampton Wanderers) left footed shot from the left side of the box is saved in the centre of the goal. Assisted by Rajiv van La Parra.